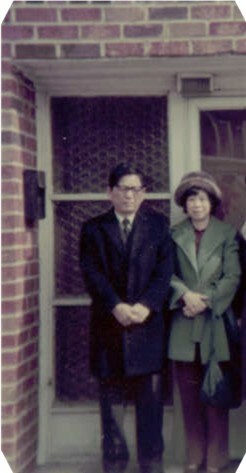 My grandparents in the early 1970s, in front of their house. A few months ago, when my grandmother and I were celebrating our birthdays together–we share both the same zodiac sign in both the Western and Eastern astrology lore (thus leading to distrubingly similar personalities, known to our loved ones as a special ability to complain and nag)–I was threatening to knit her a hat. At the time, my grandmother was all “No! Why would I want a hat? I know how to knit [At this point, my grandmother went on a long speech about her knitting prowess and her ability to knit multi-colored flowers around yokes or something. Apparently age does not dimish one’s pride in having managed to vanquish fair isle.] and I have a million hats!” So, I said, fine, and proceeded to cross her off my list of potential knitting victims. If you refer to the photo at the top of this post, you will see that my grandmother is wearing a hat that is brown, furry, and made of some kind of synthetic material. She has a love of dead-teddy-bear garments that will never end. Hysterical. My grandmother also had a passion for the unnatural fibers (the woman was seriously Not Safe around an open flame). Her hobby was sewing – mostly horribly scratchy 100 percent polyester quilts. I think a love of all things synthetic must be in the grandma rule book somewhere. I think on our first non-date “date,” you told me crazy grandmother stories. I thought it was cute! Your grandmother sounds like an absolute character. I love the way you describe her. Good luck knitting her a hat that lives up to her very high standards! Marti: I know! I think all grandmothers love the synthetics.